Do you think the mining industry has cleaned up its environmental practices in recent years? U.S. mining industry and environmental groups are in a standoff that is historically rooted, but not necessarily unbridgeable, as is evident from other countries. 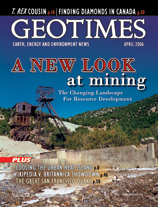 Geologists are hotly debating the genesis of 25 percent of the world's annual gold output. Canada is the sixth largest diamond producer in the world, and is getting a boost with new tools to navigate the region's unique climate and geology. Experimental archaeology seeks to understand how ancient people forged and used tools, weapons and other objects. With academic mining programs disappearing and a wave of retirements, the demand for coal workers is rising. The United States is looking at the safety of underground coal mines in light of several high-profile mining accidents earlier this year, but any evaluation of the current state of the industry needs to delve below the headlines. Months after passage of the energy bill, lawmakers are still ironing out short- and long-term goals to reduce U.S. dependence on foreign oil and gas. Pigs eat coal - it's true, just ask around. A magnitude-7.8 earthquake strikes San Francisco, Calif., sparking fires that engulf the city. 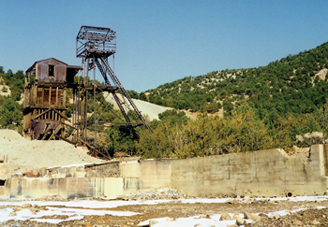 At the height of its production in the early 20th century, the Kelly Mine near Socorro, N.M., shown here in 1995, was well-known for producing a green-blue zinc carbonate mineral called smithsonite. But now, it stands largely abandoned and as a symbol of the mining days of old. Today, new technologies and policies, as well as scientific progress, are shaping a different view of mining. Photo is courtesy of Christopher M. Keane.